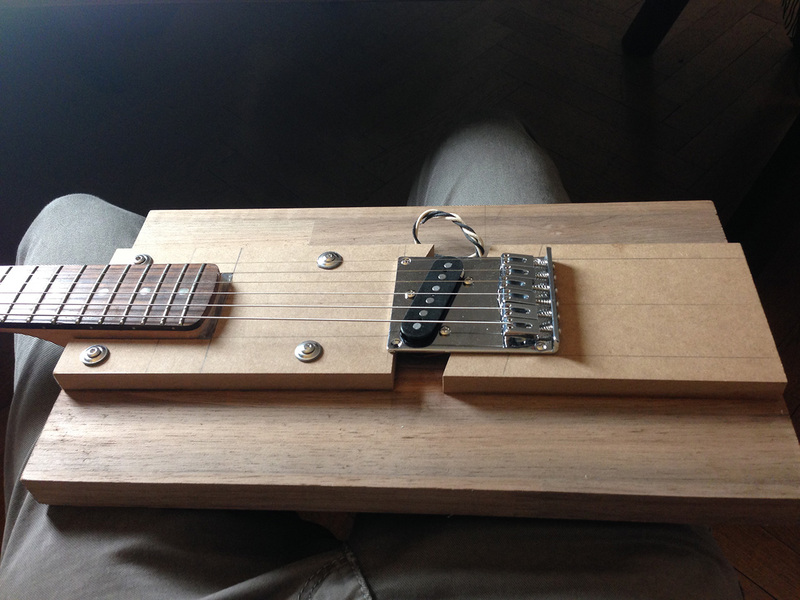 Then I spend allmost all my spare time to watch videos on youtube where people showed step by step how to make a guitar from three pieces of wood, in every possible detail. I was hooked. Now for my very first guitar I didn’t want to spend a lot of money on wood and tools. I wanted to build the simplest possible electric guitar I could make. I had some pieces of wood lying around which were used to make a bookshelf. I bought a cheap neck on ebay and then I bought some pieces of MDF. One saturday I walked by my favorite little custom guitar shop around the corner to ask whether they had a really cheap telecaster bridge and they did. I also bought an audio jack, two potentiometers, a capacitor and a bridge pickup which they make themselves. I paid 90€ for all the parts and I was ready to go. In the next picture you can see how I made the cut. I attached another piece of MDF with a screw clamp as a rail / guide for the jig saw. This way you can make perfectly straight cuts and is highly recommended if you don’t have any better saw. Then I already attached the neck to the body of the guitar so I could make precise measurements for the bridge. Its important to have center line on your guitar body which you can relate to all the time. Once the neck is in its final position, determine the exact center line and put the bridge as precisely as possible on it. 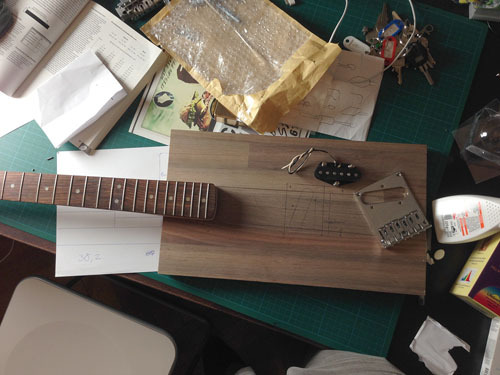 On the next picture you can see how I drew the positions of the bridge and the pickup on the wood so I could always see if something does not fit before putting everything together. Since I didn’t have a router and the wood for the body wasn’t thick enough anyway, I decided to use an extra layer of MDF, made of two pieces to hold the bridge. In the middle of the two pieces I left a gap for the pickup. 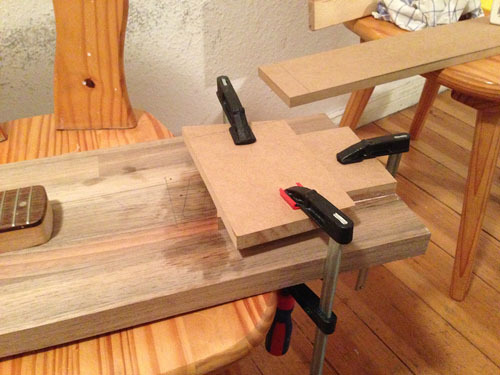 I used wood glue and screw clamps for attaching the MDF and that worked extremely well. 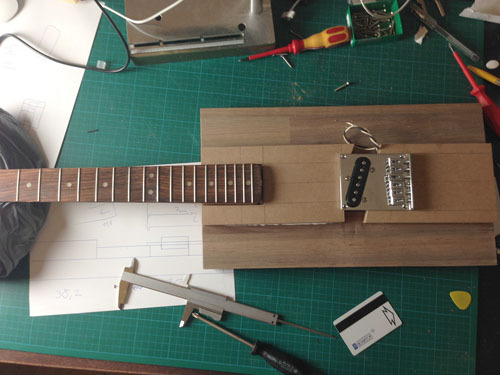 After that was done I drilled some holes for the strings and the bridge and attached the bridge to the body for a first test with strings. Now the last missing was the electronics compartment and like I said before I kind of forgot about that. At least I really didn’t think about how I would do it with the tools I had at hand. I could’ve done something similar to the bride but all the things I came up didn’t satisfy me. 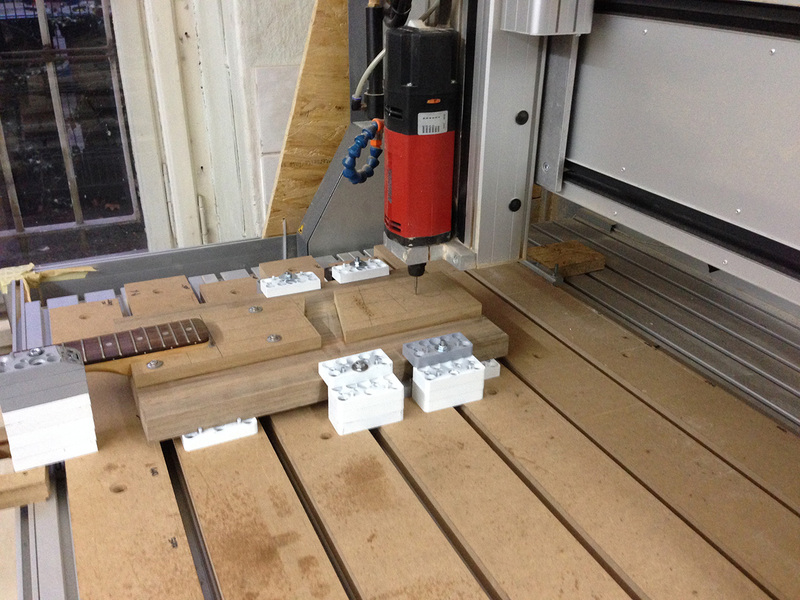 Luckily I talked to a friend of mine that day and he said he had a CNC mill/router which we could use to make the compartment right behind the bridge. I accepted the offer and the next day I drove to his workshop. I had to disassemble the bridge again for that but that didn’t matter. After I had the 8x8cm compartment I drilled a small hole for the pickup cable. I screwed the potentiometers (tone controls) on a thin piece of MDF and used that as the cover/control panel for the electronics compartment. 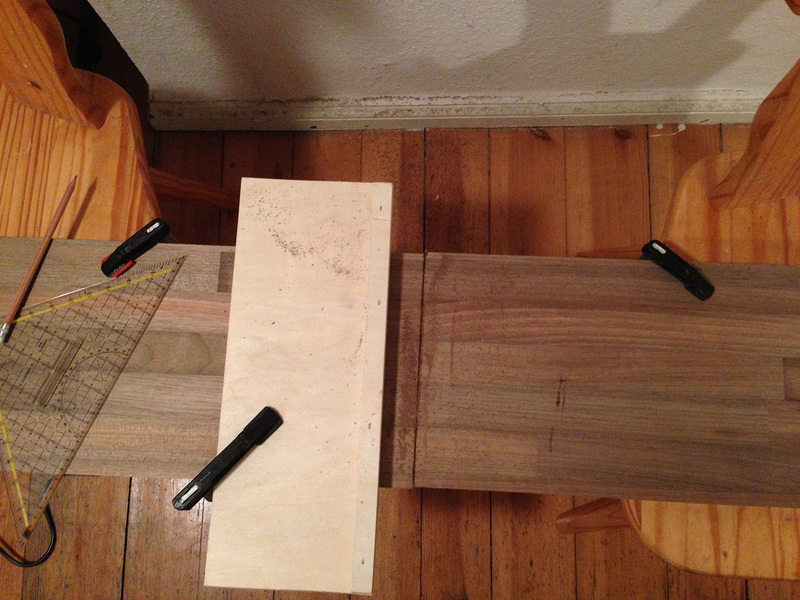 Finally I sanded off some of the sharp edges of the wood and attached some Dunlop Straplocks. My friend and band colleague David came over to my place for dinner and a glass of red wine and played on it while I recorded him. First he is playing through an Orange Micro Terror and my self-made cabinet and later through the Fender Hot Rod Deluxe III and various pedals. I also bought a really insightful book about how to build guitars. Its not that expensive and provides tons of good tips for certain steps of building a guitar and setting it up properly. I hope this is an inspiration to you to build your own electric guitar. It took me about two days to finish it and it was fun all the way. Stay tuned for more! 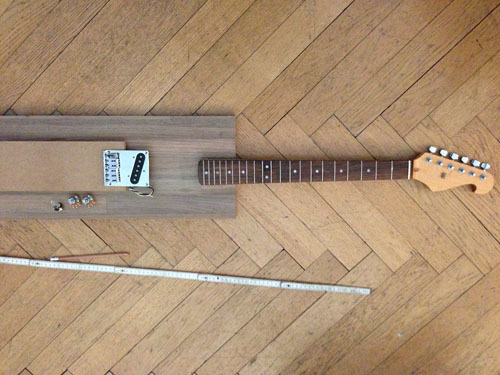 Somebody on the internet already made his own electric guitar from these instructions and even improved it! Check it out! 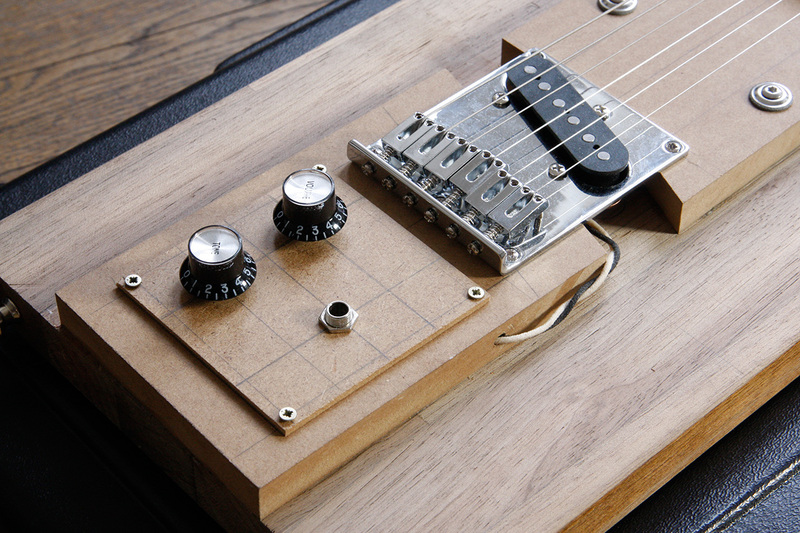 This entry was posted in english, music, projects, Uncategorized and tagged audio, diy, electronics, guitar, howto, intrument, music, parts, prototyping, sound. Bookmark the permalink. This is a very interesting project. Maybe someone here has some with experience in using pickups and could provide us some help. A friend of mine is currently restoring an old gong. It was made by UFA and was used in cinemas in the early and mit 1900’s. To show you what I mean: our gong looks a bit like this one. Our problem is that we don’t get any signal out of the acutal pickup. We both have absolutely no experience how to check if a pickup is dead and if maybe a new one (which?) could help. Just use a Multimeter and connect it to both ends of the pickup/coil and see if something is going through. Not half as planful, mostly inspired by Jack White’s “Who says you need to buy a guitar?” I too build a guitar for myself in 2010. I’ve wanted to write about that for some time now, so thank you for reminding me 😉 and thanks for your blog and podcast output. 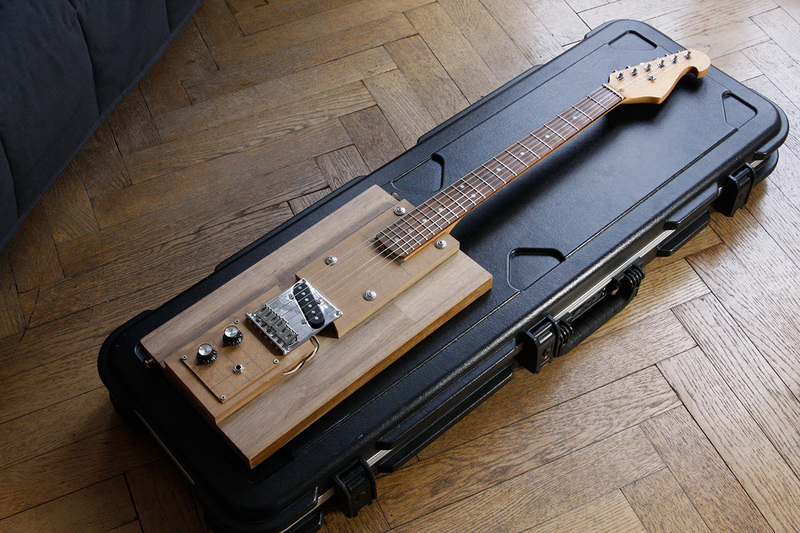 Hallo Hukl, ich hatte vor ein paar Wochen mal versucht, dir per “Smyck”-E-Mail einen Link zu einer Doku zu schicken, in der man einem Gitarrenbauermeister beim Elektro-Gitarre-Bauen zusehen kann. Da ich ein paar Downloadlinks reingetan habe, habe ich jetzt ein bissschen Bammel, dass sie in deinen Spam-Ordner gerutscht sein könnte. oder in der ARD-Mediathek nach “Handwerkskunst! Wie man eine Elektro-Gitarre baut” suchen. Viel Spaß beim gucken! ← Why (not) pay for music?